iGoogle is now officially closed, if you try to access iGoogle at google.com/ig‎ you will be redirected to the Google home page. iGoogle launched in May 2005, which was over eight years ago. About 18 months ago, Google announced iGoogle's closure would be today, November 1, 2013. iGoogle users revolted but Google did not change course, as you can see. Last month, Google issued a thirty-day warning to iGoogle users and now it is gone. The only thing remaining is the search listing for iGoogle, which will go away shortly as well. 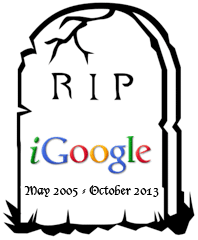 As we announced on the Official Google Blog nearly a year and a half ago, today we’re retiring iGoogle. Moving forward, iGoogle will redirect to www.google.com. If you’ve been using iGoogle gadgets to access information from Google products like Gmail and Finance, you can continue to do so via our new app launcher. We know that many of you enjoyed your customized iGoogle experience, so if you’re looking for alternatives, there are some options that might fit your needs. iGoogle Alternatives Discussion - Share ideas about services similar to iGoogle.